Pole Day Wrap Up; Yawwnnnnn………Ed Carpenter wins the Indianapolis 500 Pole…….WHAT?!!! I got a little tradition busting to share with you, pal. Consider this: The qualifications ‘traditionally’ end at 6pm local time in Indianapolis. In a smooth transition of television schedule adjusting and shell game type of hidden moves, NBCSN bounced the pole qualifying and showed us the last few qualifiers in a made for television, drama filled session. The Fast Nine competition was set to run at 4:30pm and give cars multiple runs at a pole shot. Due to weather, this final qualifying segment was ran at 6:30 pm in Indianapolis on Saturday and in a further break with ‘tradition’, a small budget, one car owner/driver combination literally kicked BIG TEAM derriere (insert your favorite Death Star team name here). Yes, Virginia, David slayed Goliath, there IS a Santa Clause and if you are an open wheel fan that follows the sport even on the most distant of periphery, you realize that this is big time upset in the making. Now, if you are more than just a casual fan of American open wheel racing and know some of the recent, non-traditional history of the sport, you have heard the behind the back whispers about Ed Carpenter; he eats from the Hulman silver spoon, never had a real job, has had everything handed to him. Well, Ed first came to the speedway at the age of 10 when he watched Rick Mears win the pole in 1991. Fast forward to 2013 and EFFING- KA- BOOM. Super Team Death Star literally explodes and as some of my fellow blogging scribes like to say, death star shrapnel reigns down on the Indianapolis Motor Speedway. I am still in shock and it is 12 hours later. Oxygen, please…..Doctor? Doctor? This topic will be covered by many far better word smiths than I but I can guarantee, none of them have been walking the hallowed grounds of the speedway as long as I, searching for that long lost upset similar to the ones we saw in years gone by. Yesterday at the speedway held so many story lines, drama and fairytale ending that I can tell the traditionalists, maybe, just quite maybe, there will be a return to the glory days of a small team swigging milk after the end of 500 long miles. This with just 33 and a half cars on the property! So, hit these links and follow the musings of the folks that hang out at the Blogapalooza Deck at pit out of the Indianapolis Motor Speedway. They got ALL the good read! 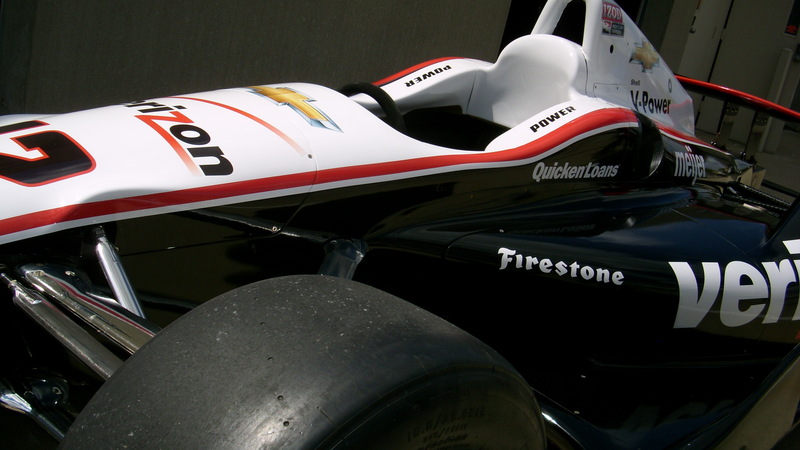 Here is a shot of what I hope the the erst of the field sees during this years’ running of the Indianapolis 500 Mile Sweepstakes Motor Car Race. 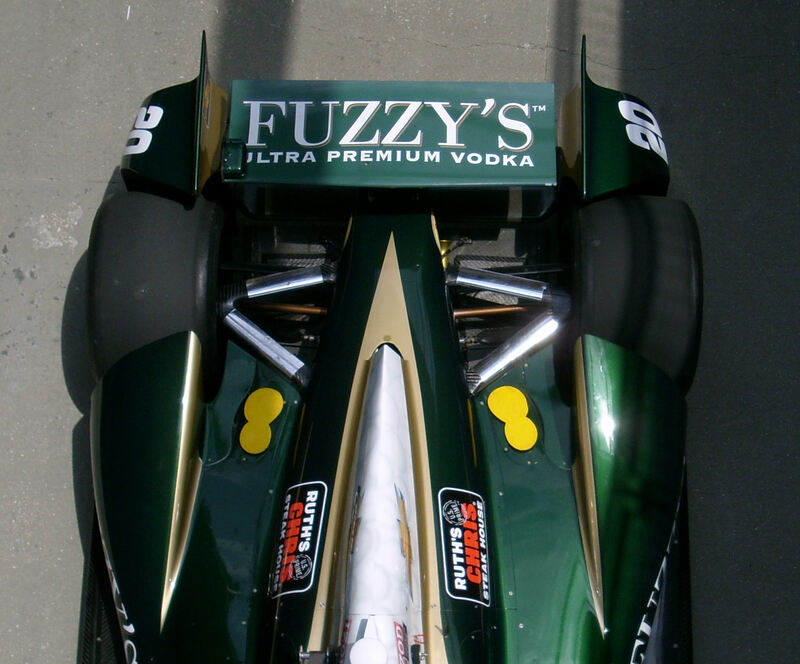 Yeah, it’s the back of Ed Carpenter’s car…. Thanks for reading and we will talk to you next time!